I love these no-boil, one-pot dishes. They are delicious and make for an easy clean up since they are all made in just one dish. 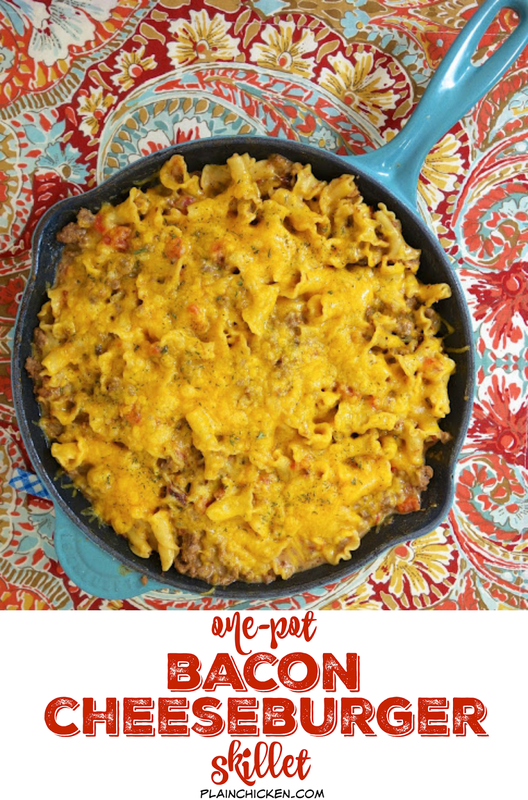 This Bacon Cheeseburger Skillet is crazy good! How could it not be? Pasta, cheese, hamburger and bacon? I couldn't stop eating this! 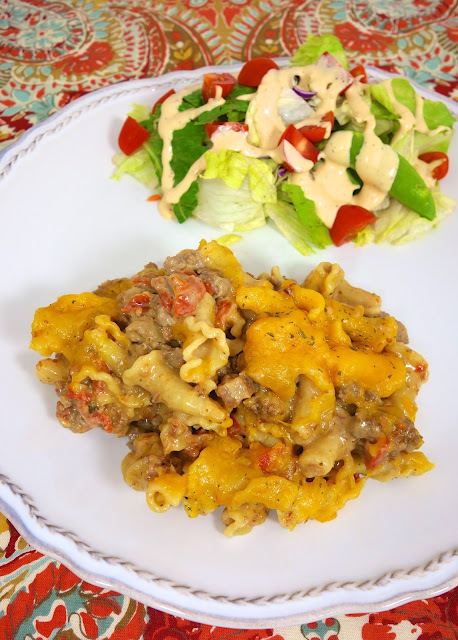 It is cheesy, creamy and has a little kick from a can of Rotel tomatoes. If you are sensitive to heat, make sure you use a can of Mild Rotel. This dish is super easy to make. It only took about 30 minutes from start to finish. I love quick and tasty meals, especially during the week! This makes a lot. Fortunately, it is great reheated for lunch or dinner the next day. Follow Plain Chicken's board One-Pot Meals on Pinterest. 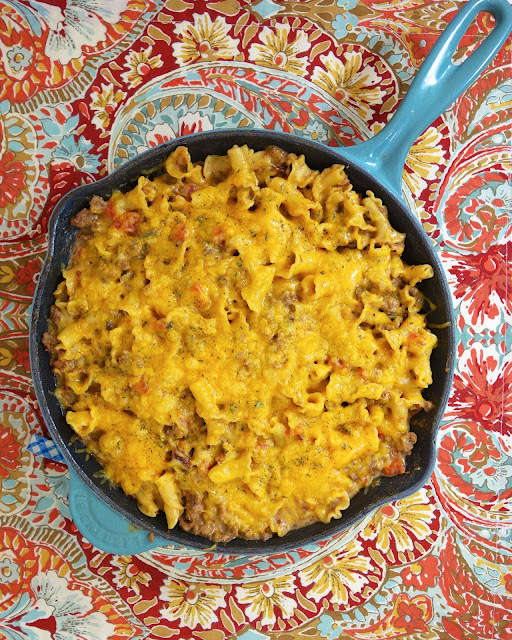 In a 12-inch oven safe skillet, cook ground beef until no longer pink. Drain fat. Add onion flakes, broth, tomatoes, cream cheese, pasta, bacon, salt and pepper and stir. Bring to a boil. Reduce heat to low and cover skillet. Simmer for 15-20 minutes, until pasta is tender. Remove skillet from heat and stir in half of the cheese. Top with remaining cheese. Broil until cheese is melted and bubbly. I was wondering the same thing. I would leave the bacon out if I made it for my son. I love your skillet meals! Do you think a ten inch skillet would work? This was yummy! Cheated and used packaged bacon bits. Will make again! I made this last month and making again today. My boys loved it and it was so easy. Thank you for all the great recipes! !